Churros and chocolate are a rich and tasty combination. The Spanish typically eat them together for breakfast, as an afternoon merienda, or late night stop at the street vendor on the way home. Churros are light and crispy Spanish fritters. Spanish hot chocolate is very thick and creamy. To make churros and chocolate, you’ll need a large heavy-bottomed frying pan, 2 medium saucepans, a mixing bowl, a fork, 2 large spoons and a pair of tongs. 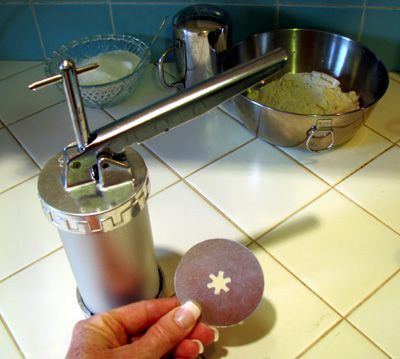 To shape the churros, you'll need to squeeze the dough through a large cookie press or "churrera" and a disc with a large star-shaped opening as pictured above, or a pastry bag with a star-shaped nozzle. Measure all ingredients below into separate containers and set aside. In a medium sauce pan, pour 1 cup water. Add oil, salt, sugar and stir. Bring water to a boil. Pour vegetable oil into a large heavy bottomed frying pan. Make sure there is about 2 inches of oil in the pan to cover the churros, and so that they float freely while frying. Set pan aside until needed. While waiting for water to boil, dry the cup used to measure the water and use it to measure flour, since it is necessary to have equal parts flour and water. Pour flour into a medium-sized mixing bowl. Add baking powder and stir. If there is room on the stove, heat oil in frying pan on high. Once water boils, remove saucepan from stove. Slowly pour boiling water from saucepan into flour mixture - stirring constantly with a fork until it is a smooth dough without lumps. Stir only until mixed and smooth. The dough should not be runny like a batter, but rather a smooth, but sticky dough. Note: Proceed immediately to the next step. If dough is left to sit in bowl, it will begin to dry out and will be difficult to squeeze through the cookie press. Spoon dough into the cookie press or pastry bag. After filling the cookie press, put the top/handle on and make sure to push down the press so there is no air in the cylinder. Frying pan with oil should be heating over medium-high to high heat. Carefully squeeze dough into hot oil (350 F to 375F degrees) and fry until golden brown. Usually, the dough will form a ring as the dough is squeezed into the oil. Do not put too much dough in the pan. The churros must float freely while frying. When golden brown, turn and brown the other side. Carefully remove churros with tongs, and place on paper towels to drain. If more dough is in cookie press, squeeze into pan and fry. 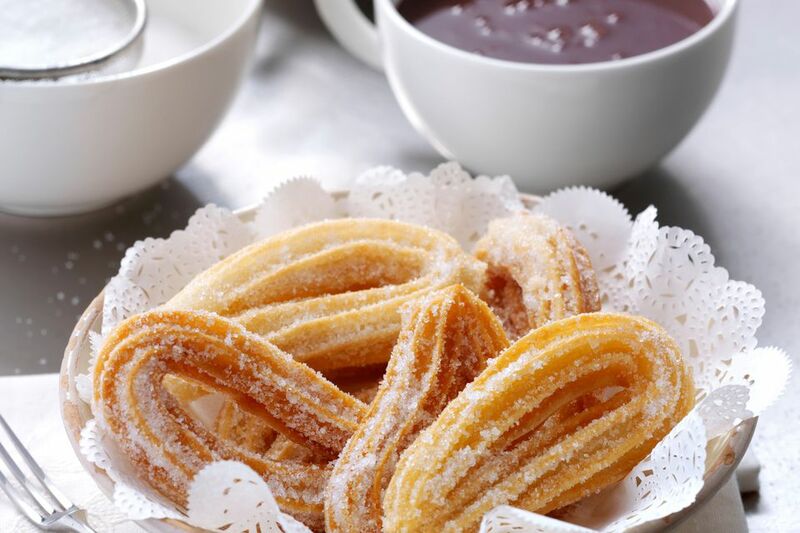 While churros drain, pour the cold milk for hot chocolate into a medium saucepan and add the cornstarch. Whisk to dissolve the cornstarch. Once the cornstarch is dissolved, heat the milk on medium-high just until it boils, then remove from heat. Once drained, cut churros into convenient lengths. Sprinkle with sugar and arrange on a serving dish. After removing milk from heat, add the chocolate immediately, and begin stirring until the chocolate is completely melted, and sugar is dissolved. Return the pan to the stove on medium heat and stir slowly. (Do not heat the milk over high heat as this will cause lumping.) Taste the chocolate for sweetness and adjust sugar if needed. The milk mixture should thicken quickly. As soon as you see it thicken, remove the pan from the heat so the cornstarch will not thin. Ladle into cups and serve hot, along with the churros.